Adding a beautiful new room to a home is a heady mix of creativity and professional know how. It all begins with a vision of what the room will look like and what it will accomplish. Beauty and elegance are often high on the list for homeowners. They also often want additions that are comfortable, welcoming and full of natural light. Another important factor is to make sure that an addition matches, complements and harmonizes with the original home. It is important to match the color and style and general tenor of the new project with the old. An addition that looks like it doesn’t belong will not benefit the homeowner and can even impact its appeal to future homebuyers. A good idea is to carry over the most appealing elements of the existing home to the new space. If a homeowner likes the crown molding of the home, or enjoys the style of flooring, it makes sense to include those in the new project. The siding, roofing and trim styles should also be matched closely. Additions need not be obsessive about matching everything. Doing so might mean missing out on advances in materials that expand energy efficiency as well improve ease of operation. If a homeowner has aspects of a home that aren’t appealing it obviously doesn’t make sense to bring those elements into the new space. The home can still be tied together by a skillful use of color, materials and tone. 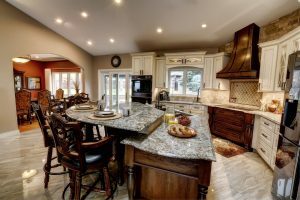 It’s important that the new space blends well with the older home, but it doesn’t have to be an exact replica. An experienced designer of additions can help guide the homeowner along the path of creating an addition that blends well with the existing home. One design technique is to create a transition zone into the new space, thus softening the impact of any large changes in style.